Language, Literacy, and Cognitive Development addresses the impact of language and literacy on cognitive development. Top researchers examine the cognitive significance of the growth in children's ability to express themselves symbolically, whether that involves communicating linguistically, mathematically, logically, or through some other symbol system expressed in speech, gesture, notations, or some other means. The book contributes to refining and answering questions regarding the nature, origin, and development of symbolic communication in all its forms, and their consequences for the cognitive development of the younger child at home and the older child at school. Contents: Preface. Part I: Introduction. E.K. Scholnick, Language, Literacy, and Thought: Forming a Partnership. Part II: Verbal and Gestural Communication and Cognitive Development. K. Nelson, L.K. Shaw, Developing a Socially Shared Symbolic System. N. Budwig, A Developmental-Functionalist Approach to Mental State Talk. D. Gentner, J. Loewenstein, Relational Language and Relational Thought. S. Goldin-Meadow, From Thought to Hand: Structured and Unstructured Communication Outside of Conventional Language. Part III: Notational Systems and Cognitive Development. D.R. Olson, What Writing Does to the Mind. R. Lehrer, L. Schauble, Symbolic Communication in Mathematics and Science: Co-Constituting Inscription and Thought. C. Dauite, Social Relational Knowing in Writing Development. Part IV: Conclusion. 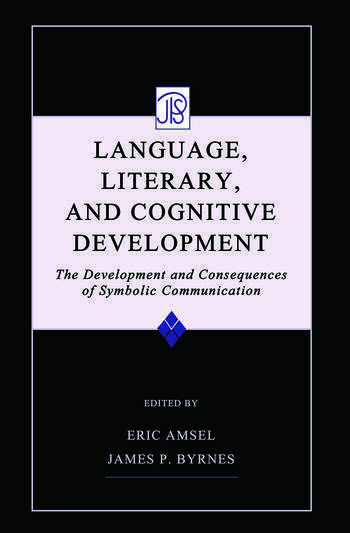 E. Amsel, J.P. Byrnes, Symbolic Communication and Cognitive Development: Conclusions and Prospects.